This chart has been the best forecast tool for short term (2 to 6 months) direction of House Prices. Annual House Prices change (HP) followed Sales To Stock Ratio (STSR), 2 to 6 months later. - On average STSR below 33ish have caused prices falls, and STSR above 33ish have caused prices increases. - Current STSR looks to be around 24 now (and should keep falling. Let's not forget that!). impressive! Very high correlation between those two data sets. Nice! Definitely turned down and will pull HPI down forthwith. The mainstream media are being remarkably bearishly forward looking today. It would be an easy one to ignore or spin. 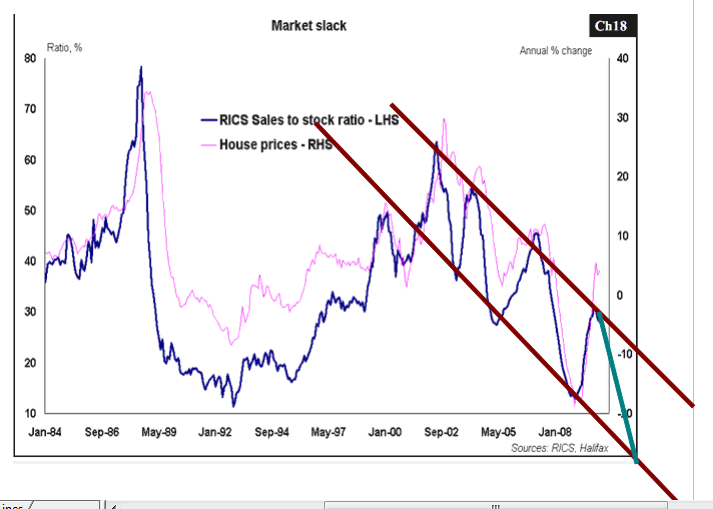 That chart is the first thing I look for on the RICS survey. I have to say I did get somewhat aroused seeing it this morning! Yep. First time I saw that chart I had the same surprise. But then, later, one day I realised that they are measuring almost the same thing. I mean, merchandise is accumulating on the shelf = prices are too high. And vice versa. This STSRatio is just measuring supply and demand. No wonder it points to short term price changes. Right? 'Tis nice. I really like that chart. And let's do a little exercise here: Can anyone think of anything that could stop that little line going even further down? 1) What could bring more buyers into the market? 2) What could reduce the number of sellers in the market? A thing of beauty and a perfect example of why I can't leave this bloody website alone. (...) and a perfect example of why I can't leave this bloody website alone. (Annual) House Prices change (HP) followed Sales To Stock Ratio (STSR), 2 to 6 months later. - Current STSR (see chart above) looks to be around 24 now (and should keep falling. Let's not forget that!). Very good ToW. V good. just wondering why the 2007 peak price ...Isnt. OIC, its not prices, but the rate of change in prices. yes...supply and demand here.....lower lending =lower demand. Exactly, annual change, it was above zero until 2007. Exactly. No wonder they match so well - merchandising not selling, piling up. Actually, it is even worse than your usual retail merchandising, as the retailer would just order less from suppliers. Not here, in the housing market. They keep comin'. High! Low!..need my next fix. No seriously now, what is OIC? you are supposed to say...Sweet. I say Dude, you say sweet.....oh forget it. Am I the only one that sees a pattern here? Looking at Rightmove, I see supply is still increasing. Yes, I mean, no, I saw that pattern as well. If it goes down that much it would mean prices falling by 20% per year. If STSR suddenly stays flat (by some miracle) it would still mean prices falling by some 8% per year. Reality will probable be between these 2 scenarios above?